I was shocked as I walked into the completely transformed space of Artscape Youngplace to see the Toronto Premier of Bad Jews presented by the Koffler Centre of the Arts. Completely decked out with risers, a lighting rig, a full stage and even a kitchen sink(!) I was amazed and slightly wary of the time and energy they had put into creating a traditional theatre space in the unique classrooms of Artscape Youngplace. I’m not the biggest fan of realism, and so when I saw the kitchen sink, well, let me just say, I was nervous that I was about to see some highbrow realist theatre that— in my experience— prioritizes the production elements over the performances and storytelling of the piece. I could not have been more wrong. Subtle, affecting, brilliantly written, and evocatively performed, Bad Jews gives me hope for realism yet. Written by Joshua Harmon, the story involves cousins coming together after the death of their grandfather. Set in the evening after the funeral, and the night before they sit shiva. What arises is arguments around judaism, legacy, and family. All of this comes out in a fight around who will get the family heirloom, their Pappi’s Chai (חי). Symbolizing life, as well as their grandfather’s survival of the holocaust and his subsequent marriage to their grandmother, the fight over this heirloom is deeply personal in a variety of ways. A representation of religion, family, and love all at once, two of cousins want it, and they aren’t afraid to go for the jugular. Harmon has delivered a darkly funny, at times shockingly sharp script. It is equal parts tender and biting, smart and unwieldy. The story unfolds with delicacy at times, and a slap in the face at others, with some lines literally leaving me breathless. Thematically dense and yet completely accessible, the play picks up on themes of memory and memorial often associated with the stories of descendants of holocaust survivors, such as the struggle around naming, crises of faith, and family legacy. The performances were another strong element of the show. I struggle to think of who I liked best. I related with each and all of the characters at different moments of the play, a sign of a good script in good hands. Rebecca Applebaum’s performance of the confrontational Daphna was fierce, at times painful, and so honestly performed, it is worth going to see her alone. 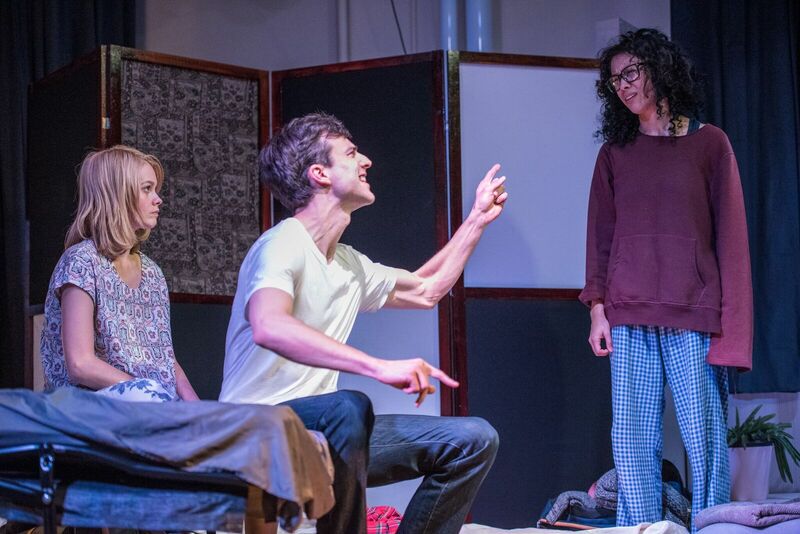 But she is joined by the equally elegant performances of quiet non-confrontational Jonah (Daniel Krantz), stubborn “black sheep” Liam (Kristopher Turner), and visiting shiksa girlfriend Melody (Julia Vally). The best scenes were when all these performers were on stage at once, demonstrating what great acting can do to a great script. As someone mentioned in the talk back, there is a danger of the play giving rise to jewish stereotypes as opposed to well rounded characters. I am happy to say that the cast, and director Michèle Lonsdale Smith, have delivered a subtle, powerful, funny, and intellectually stimulating piece of theatre. The best part of the performance for me was watching the reactions of audience members around me. Someone laughed loud at Applebaum’s performance, whispering to his partner, “it’s just like your sister!” During the talk back, the conversation revolved around how disturbingly recognizable the characters were. This is in no small way owing to the amazing performances and bitting script. Much of the play discusses faith and the intricacies and contradictions of being jewish today—do you need to be a “super jew,” who goes to Israel and joins the army, or a “bad jew” who marries a shiksa? But, as Turner mentioned in the talk back, this show, first and foremost, is about family. I am not jewish (although I have been the shiksa someone brought home), but I am from a loud, opinionated, highly educated family who won’t hesitate to speak their minds. This play spoke to me in a way that was surprising, hitting some hard to reach spots that many of us keep guarded. It is a brilliant, crisp, dark comedy; Bad Jews is so, so good.